OneRepublic and Jason Mraz, a pop rock band and an alternative singer-songwriter, recently released new albums. With the band’s new song list, OneRepublic is attempting to prove that they are more than just a one-hit wonder, while Mraz showcases some of his best moments while on tour around the country. Read on to find out how these new albums fared critically and if they’re worth the listen. The album’s leading track, “Made For You,” represents the CD as a whole, merging different styles and orchestral elements. Starting off by showcasing Ryan Tedder’s piano skills, the song then progresses into the band chanting lyrics from “All the Right Moves” (another song on the album), and concludes with exactly the unexpected: the audio of a conductor tapping his baton and a boys’ choir angelically repeating what the band has just sung. “Secrets” is a prime example of how the cello (the band’s most unique characteristic) can be blended with a powerful chorus and almost hip-hop-like verses about how the songs written are true and not just money-makers. Songs like “All This Time” and “Fear” also feature the cello greatly, while other songs break new ground, like the quirky “Everybody Loves Me” (relying heavily on the acoustic guitar’s twang) and “Good Life” (featuring a strong drum beat and a faint synthesizer). “This time/don’t need another perfect line/don’t care if critics never jump in line/I’m gonna give all my secrets away.” This is a lyric from “Secrets,” and it sums up the band’s identity in that they write honest, heartfelt lyrics that don’t seek out a number one spot on the Billboard charts, even though with Waking Up, that’s certainly a realistic feat. This past August, Jason Mraz performed at Chicago’s Charter One Pavilion, and on a stage adorned with oriental rugs, Mraz let loose a wonderful volley of sweet melodies to a throng of his devoted and adoring fans. 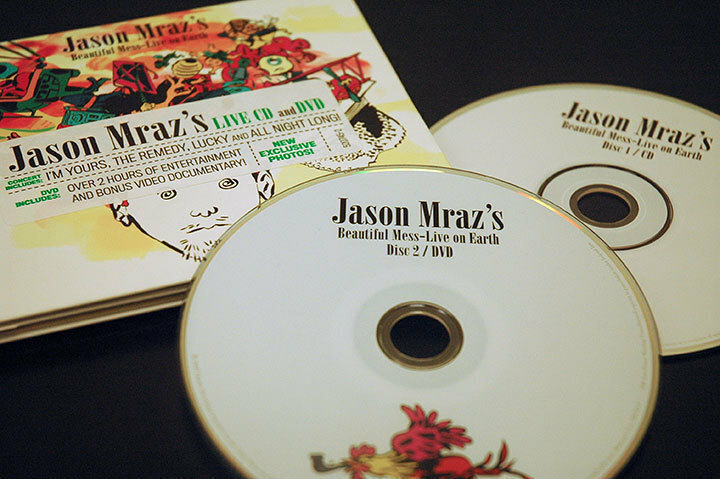 Recorded as part of his Beautiful Mess – Live on Earth tour, which is still ongoing, Mraz’s live CD and DVD of the concert were released on Nov. 10 to great critical acclaim. It features not only the smash hits “I’m Yours,” “The Remedy,” and “Lucky,” but also Mraz at his absolute best. Mraz burst onto the scene in 2002 with his debut album, Waiting for my Rocket to Come, and the single, “The Remedy,” which peaked in the top 15 on the Billboard Hot 100 Chart. This was not the last we would see of Mraz as, just three years later, he released the album Mr. A-Z, receiving some commercial and critical success along with hitting fifth on the Billboard album chart. Just last year, Mraz released We Sing. We Dance. We Steal Things, which brought him by far his widest level of recognition and great international success. Mraz’s Beautiful Mess – Live on Earth is a skillfully put together CD and DVD album that takes some of his best tracks from his first and third studio albums to form quite the set list. Mraz is adept at orchestrating a symphony out of his legion of fans and controls his audience as if he’s been doing it for years, knowing when he needs to add a little extra and when to just simply kick things into gear. At one point during the concert, Mraz jokes that pretty much all he’s got are love songs, which is a very true statement. While he does sprinkle in pop sounds and extremely catchy rhythms and beats, his lyrics focus on love quite a bit. If you’re interested in catching him live, check out www.jasonmraz.com for his upcoming concert dates.